Emphasising that the Kerala government will protect the rights of all devotees, Chief Minister Pinarayi Vijayan on Tuesday morning said that all those who go to pray at the Sabarimala temple will be protected. 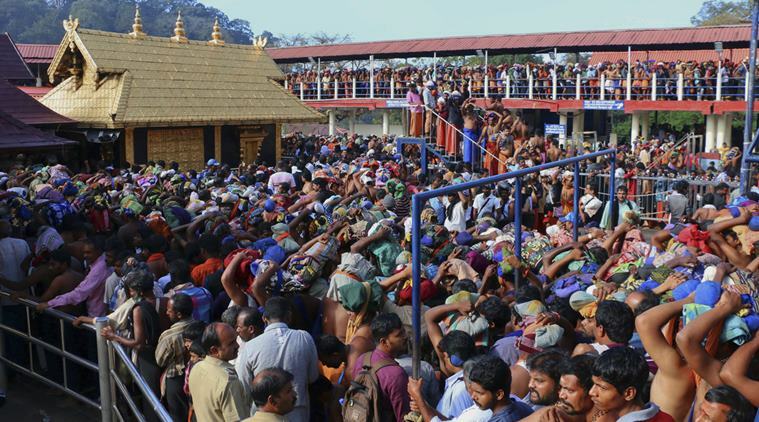 Amid intense protests in Kerala in to “Save Sabarimala Ayyappa Temple”, the talk between Travancore Devaswom Board (TDB), the custodian of the temple, and representatives of Pandalam royal family have failed to reach a consensus over filing a review petition against the Supreme Court verdict upholding women’s right to enter the temple. The meeting that was convened by TDB was attended by Sabarimala Tantris, representatives of Pandalam royal family (the family is known for its kinship with Ayyappa), Akhila Bharatha Ayyappa Seva Sangham and Sabarimala Ayyappa Seva Samajam at the TDB headquarters in Thiruvananthapuram on Tuesday. "Meeting wasn't satisfactory. We came out of meeting because they're not ready to accept our demands," said Sasikumar Varma, president of the managing committee of the Pandalam Palace, as quoted by ANI. TDB President A Padmakumar said that the Board would meet again on Friday to decide the next course of legal action. While emphasising that the Kerala government will protect the rights of all devotees, Chief Minister Pinarayi Vijayan on Tuesday morning said that all those who go to pray at the Sabarimala temple will be protected. The temple opens on Wednesday at 5 pm for the customary monthly pujas. Vijayan said this after presiding over a cabinet meeting when the media pointed out that those fighting to preserve the traditions of the temple were screening all vehicles on Tuesday to see if they had women in the age group of 10-50. "Yes, I have also been told that some people have started screening vehicles. Such a thing cannot be accepted. No one can take law into their hands. The government will ensure that nothing of that sort happens. Those who want to pray cannot be stopped," said Vijayan. He pointed out that the government had made it very clear that it will not file a review petition against the Supreme Court's September 28 verdict allowing women in the age group of 10 to 50 to pray at the Sabarimala temple. "We have already made this very clear that we will abide by whatever the apex court verdict is. Now that the verdict has come, we will implement it," the chief minister said. On Tuesday morning, hundreds of devotees, including a large number of women, protesting against the Supreme Court ruling, gathered at Nilakkal which is about 20 km from the foothills of the temple, located at Pampa, and started checking all vehicles bound to the temple town. Women were pulled out of state-owned KSRTC buses by a group of angry mob who have taken law into their hands. Later, it was reported that two of the women who have been pulled out of the bus are journalists. "We are determined that come what may we will not allow a single lady in the age group 10 to 50 to reach anywhere near the temple. It's a matter of life and death, and under no circumstances will we allow a breach of tradition," said a middle aged woman at Nilakkal. The reports from Erumeli, Pathanamthitta also said that protesters including women have been checking all the vehicles passing by to see whether there is any woman pilgrim heading to Sabarimala. Read More: Sabarimala Protests: Politically Motivated? Meanwhile, Anto Antony, who represents Pathanamthitta Constituency – under which Sabarimala Temple falls – in Parliament, urged the Centre to issue an ordinance as a solution to Supreme Court ruling that quashed the ban on entry of women in the age group of 10-50 years in the temple. Antony, who hails from Congress party, further attended a protest dharna, in Erumeli, organised by women’s organisations of Congress, Indian Union Muslim League and Kerala Congress (M). All India Democratic Women’s Association (AIDWA), which is affiliated to the CPI(M), however, in a press statement, denounced the threats of BJP-RSS to women and AIDWA leaders over the apex court’s judgement. Condemning the “efforts of BJP-RSS backed right wing groups to create a communal frenzy against the implementation of the orders of Supreme Court”, AIDWA said “the Court upheld the equal right of women to worship at the temple under Article 25 of the Constitution”. The AIDWA Kerala State Committee General Secretary, P Sathidevi, was threatened by a BJP leader publicly on a TV show that she should make a confession to Ayyappa, or else she would be “torn into pieces and even her dead body would not be found”. Further, BJP supporter and actor Kollam Thulasi made an open threat that women visiting the temple should be ripped apart, and one half of their body should be sent to the chief minister, and the other to the Supreme Court. Prayar Gopalakrishnan, former president of the Devaswom Board too has said that “women who enter the Sabrimala Temple will be attacked by tigers and men”. Women, who have expressed their wish to go and pray in Sabarimala with all the devotion were bombarded with similar attacks. Reshma Nishanth, a woman from Kannur district, has said that she started receiving threats shortly after she made her decision of visiting the temple public. On Sunday, the 32-year-old teacher, said in a Facebook post that she has been following a 41-day rigorous Vratam that is followed by the devotees of Ayyappa. On the same day night, a 50-strong group reportedly came to Reshma’s residence, and allegedly threatened her to take her decision to trek to the hilltop shrine of Sabarimala back. Extending its support to the government’s efforts to implement the judgement, AIDWA demanded “immediate arrest of all BJP-RSS leaders and supporters who are issuing open threats to women and women activists and trying to disturb the atmosphere of peace and harmony”.